Christmas is probably my most favorite time of the year. I love the joy that seems to be palpable, the sweet smells, and the festive music. Time with family and friends and celebrating the reason for the season warm my heart. As much as I love Christmas it is easy to lose focus, have too much to do, and get overwhelmed. In addition to the normal hustle and bustle of the season, we also have a couple of birthdays thrown in there. One of the things that help me to stay grounded is making sure I have a plan for the holidays. Read on to learn more about ways you can plan in advance for Christmas to avoid holiday stress. 1. What Type of Christmas do you want need? One of the first decisions to consider each year is what type of experience do you want to create for your family / does your family need? Do you want to make it a special Christmas with lots of memories? Will you host a cookie exchange with your neighbors? How about elf on the shelf with your kids? Are there other traditions you want to incorporate? What focus will you have on the spiritual aspect of Christmas? As Christians, we make it a priority to attend church, the kids participate in a Christmas play at the church, and we read lots of books with the kids that explain the real meaning of Christmas. How about your family? Will you attend church or go to a Nativity play or special church event? What about doing an advent calendar or advent candle? 2. Where will you spend Christmas? The next step to help you plan for Christmas and avoid holiday stress is to determine where you will spend the holidays. If your family is far away like ours, Christmas location is a question to consider months before the big day. Airplane tickets can be quite expensive this time of the year, so be sure to plan well in advance. If your family isn’t at a distance, then this question probably isn’t as critical to consider months out. If you have multiple families to visit on Christmas day itself or over the holidays, you’ll need to find out availability and start to fit the pieces of the puzzle together. At a minimum, you should have these plans ironed out at least a month in advance. 3. Will you send out Christmas cards? Because there is a lot of mail over the holidays, it’s better to send out cards earlier than later. Typically, the week after American Thanksgiving is perfect timing! 4. When are your big holiday commitments? Aside from the obvious, Christmas Eve and Christmas Day what are the other important dates you need to plan around? To further plan for Christmas and avoid holiday stress plot your key dates on a calendar. Include your travel plans, Christmas parties, kids school plays/concerts, church events, family engagements, and any other important dates. 5. How will you decorate for the season? Oh my goodness, I love Christmas decorations, the reminder of the manger scene, the soft glow of lights on the tree, a visual reminder of every family member with the stockings hung by the chimney. When considering how to decorate, you’ll want to locate any decorations you’ve used in the past. Do an assessment to make sure they are in decent shape and take notes of anything you need to replace or things you need more of. Consider if you want the decorating process to be a family event or a solo activity. 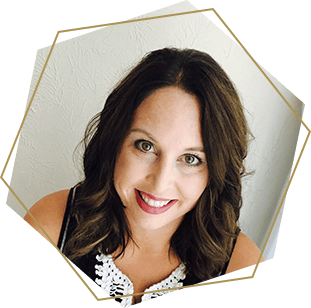 It can be nice to put on some Christmas music and make memories together, but if your family has really young kids or a crazy schedule, it’s also nice to do it by yourself or with your spouse during a quiet time. Grab My FREE 1-Page Christmas Planning Check List! Subscribe below and you’ll find it + all of my free printables in the Free-Bee Library! 6. What will you need to bake? 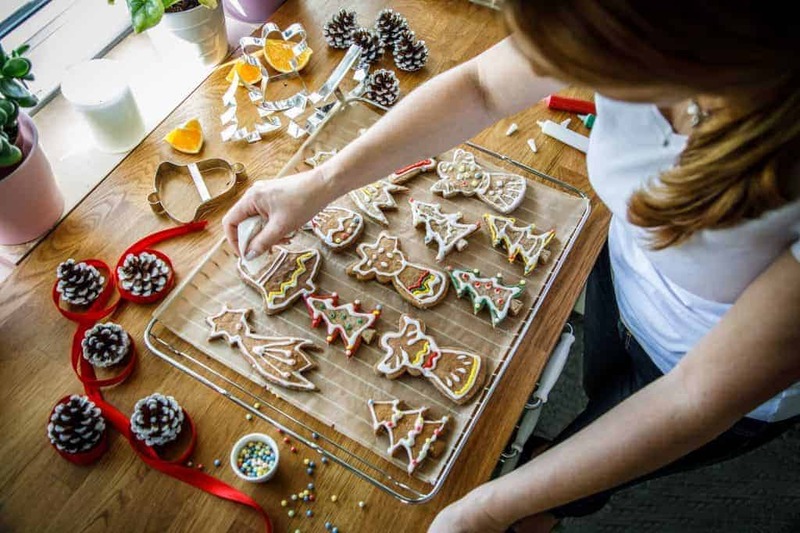 Baking is another BIG thing during the holidays and it can be a stressor if you don’t plan ahead. If you’re hosting Christmas dinner or any Holiday parties, you’ll need to make a menu. Decide what your making and what others are contributing. Identify anything you plan on baking for others, perhaps for one of your kid’s classes, a church event, or neighbors. If you have to bake for several things, then consider batch baking and freezing items for when you need them. This works great for cookies and sweet breads in particular. Last but not least, when you have your list of all of your cooking/baking needs then be sure to make your grocery list. Again, if you have a lot of baking, consider going to a membership store like Costco or Sam’s where you can buy in bulk! Check out my post how to save money on groceries for ideas on how to stretch your budget. 7. What special activities do you want to do as a family? Christmas is a great time to make memories with your family. We love to go see all of the Christmas Lights or go to see Zoo Lights. Over the past couple of years, we have seen real Reindeer (a benefit of living in the North). Take advantage of the many festivals, pageants, and celebrations that are offered in your community. Make a holiday bucket list and plot the dates on your calendar. 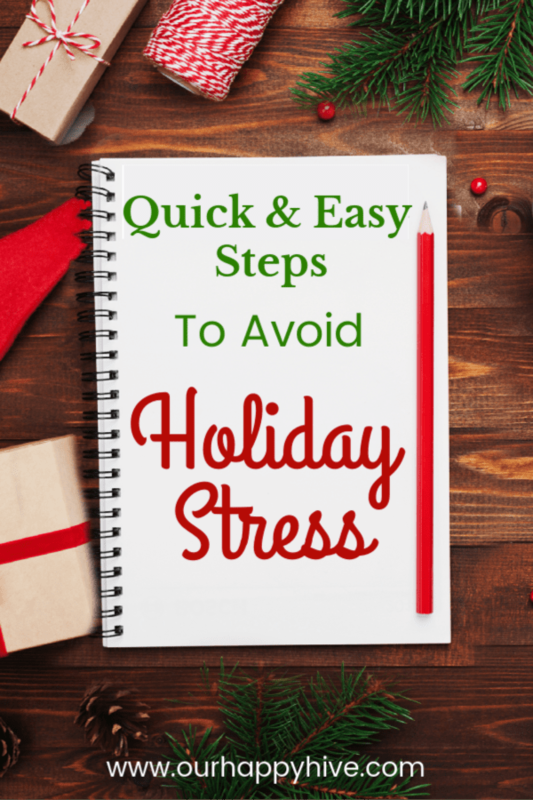 This list will help you make the most of your plan for Christmas and avoid holiday stress! 8. How much do you want to spend? If you have a budget and consistent income, plan in advance the amount you want to spend over the holidays. If things are tight financially, consider how you might save a little extra money here and there. Here are a couple of posts with ideas if you need inspiration. Either way, it’s best to start putting money aside a few months in advance so that it’s not a big financial hit when the time comes. 9. What’s on the Christmas Wish List? Ok, here’s another favorite…giving and receiving gifts. Some families prefer to ask each other what they’d like as a gift while other families prefer to keep it a surprise. Whether you seek input or go the surprise route, you should brainstorm a list of items you think others would like. While you’re at it, make sure you create your own wish list…just in case someone asks you! J For the sake of your budget, the further out you do this the better. It will make the next step easier on the wallet! 10. What gifts do you need to buy? Now that you have a list of ideas a.k.a. your Christmas Wish List, it’s time to make your shopping list. Next, group items in categories and then according to the store. For example, list all of the toys you need to purchase, and then indicate what store(s) or online site you plan on buying the items from. Remember, the further out you can start shopping, the better. Be sure to take advantage of sales like Black Friday and Cyber Monday. No one wants to stress over the holidays. We all want to make the most of our time with family and friends and to truly enjoy the season. Taking care of travel plans, Christmas Cards, your budget, menus, and gifts to name a few, you are well on your way to a smooth holiday season. By tackling these 10 steps in the months leading up to December, you will truly be able to plan for Christmas and avoid holiday stress! End the Chaos – Organize your Food Storage Containers Today!